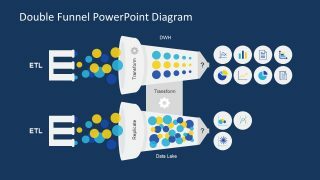 The Double Funnel PowerPoint Diagram provides an interactive visualization of horizontal process flow. The two diagrams of funnel shape here present two different concepts and their purpose together. For example, the transformation arranges data into a set of understandable information. Therefore, the circular infographic icons as the result of transformation show various data charts and reports. It illustrates the conversion of scattered data into the graphically presentable statistics. Similarly, the funnel of replicating data shows the clusters of circles inside. 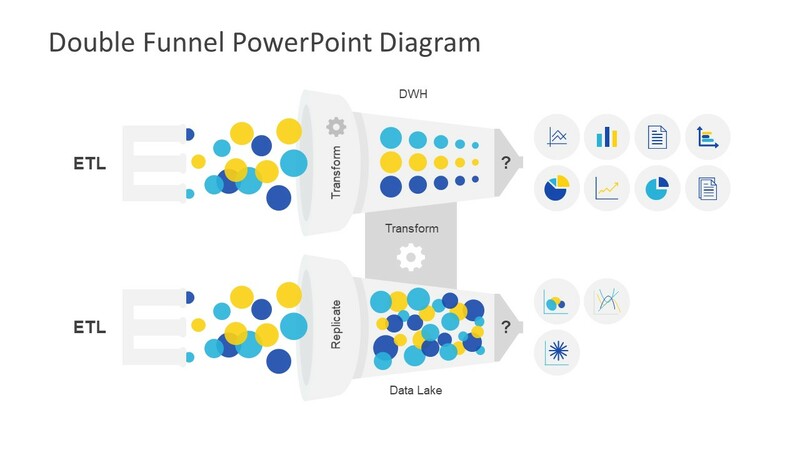 These circular PowerPoint shapes represent data in the double funnel diagram of PowerPoint. Whereas, the output of this process shows infographic chart icons without numerical evaluation. 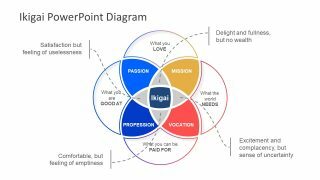 The four slide PowerPoint has vector design diagram and illustrations of technical project team. 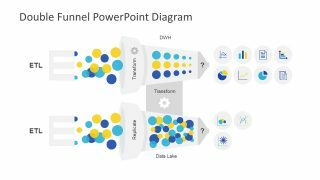 The Double Funnel PowerPoint Diagram has two slides displaying the diagram with assorting backgrounds. 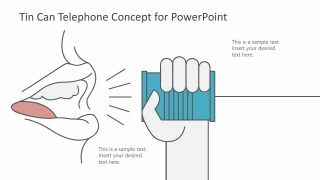 Hence, it suggests the idea of customizing a background for presentation. Also, the dark background slide is usable in presentation with dark theme with minimum modifications. The funnel diagrams are suitable for presenting sales, progress of advertising campaigns, bottleneck in linear processes etc. 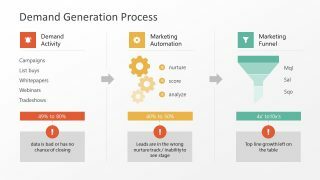 In general, the double funnel PowerPoint is ideal for describing process flow, selection criteria, filtering leads and sales funnel. Further, the slides displaying an illustration of user working on the computer has the coding icon. Also, the user infographic with html code file displays the development process for an application or system. 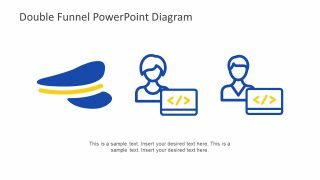 The template diagram of double funnel PowerPoint has text placeholders to insert keywords and necessary description. Although, it is useful funnel diagram for sales analysis presentations, it also highlights the factors of process for the audience. 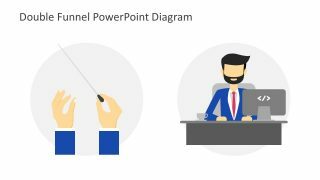 The SlideModel provides an amazing collection of funnel PowerPoint diagram for the its users. 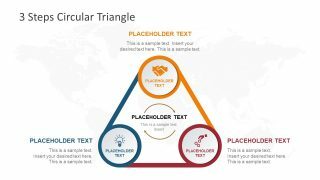 These slides inspire the audience with the help of high-quality graphics and remain longer in memory. Moreover, the innovative funnel of colorful spheres help clarify the concepts while presenting.